Are you a YNAB (YouNeedABudget) User? Update your Undebt.it account balance. This feature will keep your debt account balance current with whatever YNAB has. This means that if you have your credit card account in YNAB tied to your online account, everything will update automatically. Import your YNAB transactions. Undebt.it users won't have to record their payment transactions manually anymore. The payments and purchases you make on your credit card will be brought over to Undebt.it automatically. An active YNAB account: YNAB is a very popular budgeting app and they offer a free 34 day trial so you can try it out fully unrestricted before you buy. 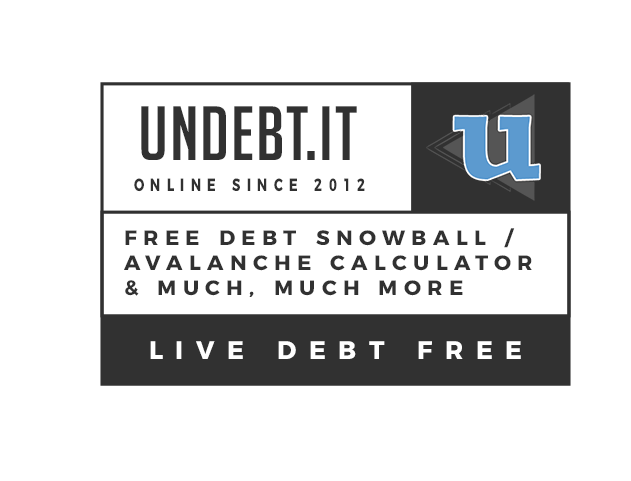 An active Undebt.it+ account: There is a one-click, no credit card required, free 30 day trial available on the My Account page. 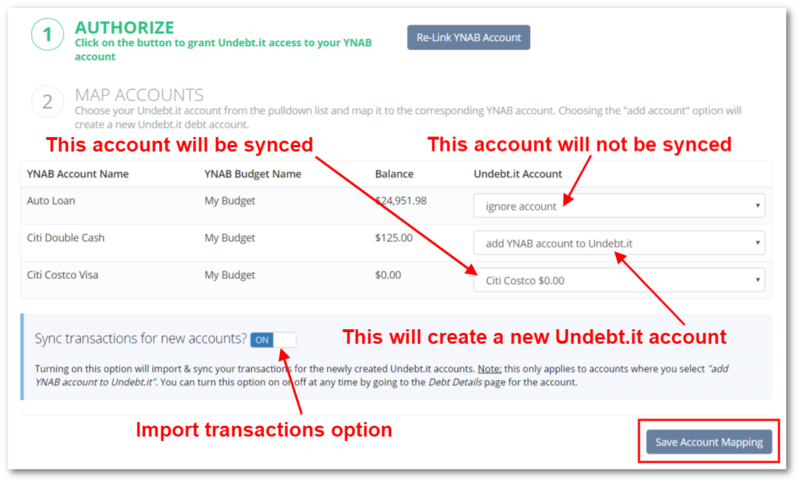 Log into your Undebt.it account and go to the YNAB Sync page (it's located in the My Account link section and also on the left-hand menu) and click on the "Link YNAB Account" button. Ignore the account: Undebt.it will not do anything with the account. 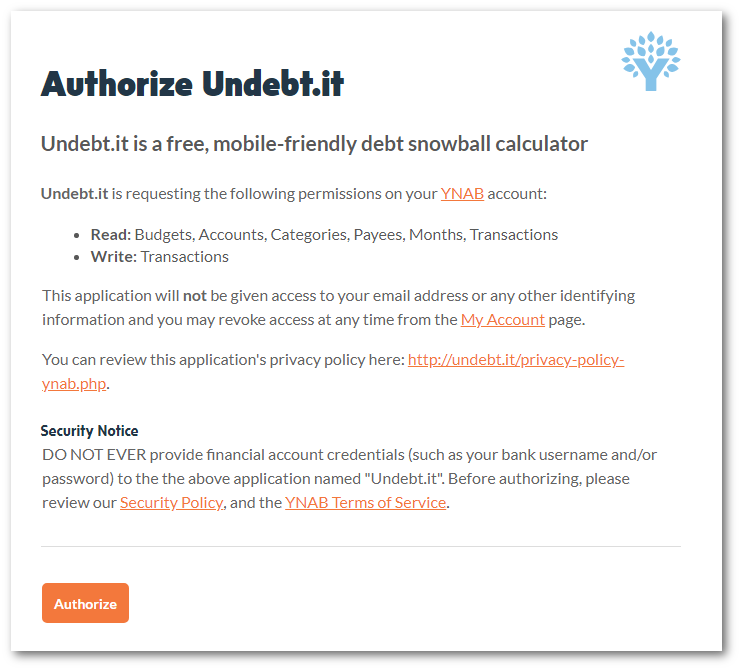 Add the YNAB account to Undebt.it: This will create a new Undebt.it debt account and add it your list of active debts. Once the account is created, go to the debt details page for the new account and change the due date, account type and any other settings that YNAB does not store. 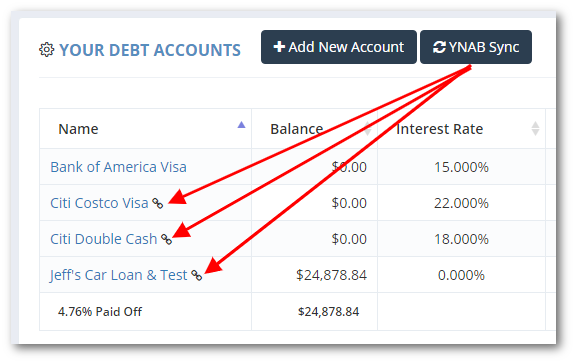 Assign the YNAB account to the proper Undebt.it account: Use the pulldown list to match each account as needed. The current Undebt.it balance is shown in the list, next to the account name. If you are mapping YNAB accounts to new Undebt.it accounts, there is an option labeled "Sync transactions for new accounts?" that applies to you. Turn the option on to bring over the transaction history along with the account balance. New transactions will be automatically added to Undebt.it during the syncing process. When you are done with the mapping, click the "Save Account Mapping" button and your account balances will be updated. You don't have to do all of the mappings at once; you can come back to this page and map an account or two whenever you like. 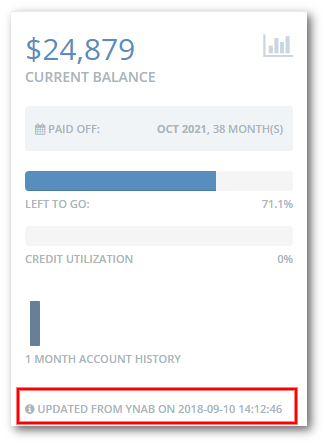 If you want to make sure everything is working as expected, go to the debt details page of a sync'd account and you should see a current date like in this screenshot. Your account will automatically sync itself roughly every day or two, so there is no action required on your part. However, if you want to manually sync your YNAB data, go to the Account List page. Click on the "YNAB Sync" button updates all of your linked accounts. There is also a similar button on the Debt Details page, but this one only updates the selected account. The preferred method is to use the one on the Account List page to cut down on API traffic since it updates all of your accounts at once. The screenshot below shows the Account List page with the synced accounts having a link icon next to the name. If you want to stop an individual account from syncing with YNAB, just go to the Debt Details page and click the button labeled "Unlink From YNAB". If you have the YNAB integration turned on, then there are 3 ways to handle payment transactions. It's important to just use one of these methods for each debt account. Import from YNAB: (as shown above) Have the payments flow from YNAB into Undebt.it automatically. Autopay: This is the standard "Autopay?" option on the debt details page. The payment transaction is automatically recorded in Undebt.it based off of the planned payment amount (regardless of what YNAB has). Manual: You can create manual payment transaction entries on the debt details page in the "add a transaction" section. For example, let's say you have a credit card in YNAB that is linked to your lender. If you want to have everything automatically brought over into Undebt.it, you would want to use the import from YNAB option. However, if you have a loan that is not linked to YNAB, you will want to use the standard autopay or manual options. YNAB reserves the right to revoke access to their API at any time. This means that this feature can stop working sometime in the future and there is nothing I could do to fix it. If you try out the integration and it's not working out for you, you can revoke Undebt.it's access to your YNAB account by logging into your YNAB account, then go to Settings > Authorized Apps and click on the Revoke link.